Oh boy, where do I begin? 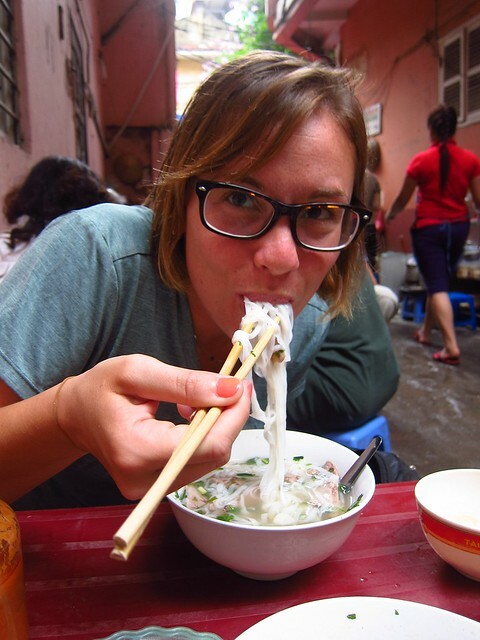 Northern Vietnam had hands down my favorite cuisine of the 20+ countries we visited over the past year (note: I do not feel it would be fair to include Italy in the running for this title). While we've loved a lot of the Southeast Asian foods we've sampled, Vietnam's was so consistently delicious that all we really wanted to do while we were there was eat. And then eat some more. In fact, on our last full day in Hanoi we had a meal on the way from breakfast to lunch, just so that we could fit in all the food we wanted to try before we left. Most street food vendors in Hanoi are one-dish wonders, meaning that the stand (or hole-in-the-wall restaurant) only serves one thing, and they do it well. The ingredients -- whether it be noodles, veggies, or meat-- are fresh, often cooked before your eyes, many dishes are served with piles of fresh herbs, and most dishes have a great balance between salty, sweet, and sour. Textures were widely varied as well. And the best part? It's not heavy like many other Asian foods can be. So, sit back, grab a snack if you're already hungry, and read on. We've described some of our favorites here and included the name and/or address where we ate them in case you ever find yourself in Hanoi (pro tip: pack fat pants). This might have been my favorite: grilled pork patties and slices of pork belly in a bowl of smoky, slightly sour broth that surely took hours to simmer to perfection, served with a pile of vermicelli noodles (conveniently cut for you at your table with a pair of scissors), a larger pile of fresh herbs such as basil and mint, chopped garlic and chilies, and crab spring rolls (we weren't sure if we should dip these in the soup or eat them separately, so we did both). Add the ingredients as you make room in your bowl and boom: one of the tastiest pork dishes I've ever eaten. We went back to this place for a repeat. Another dish composed of the winning combination (noodles, freshly cooked meat and herbs). 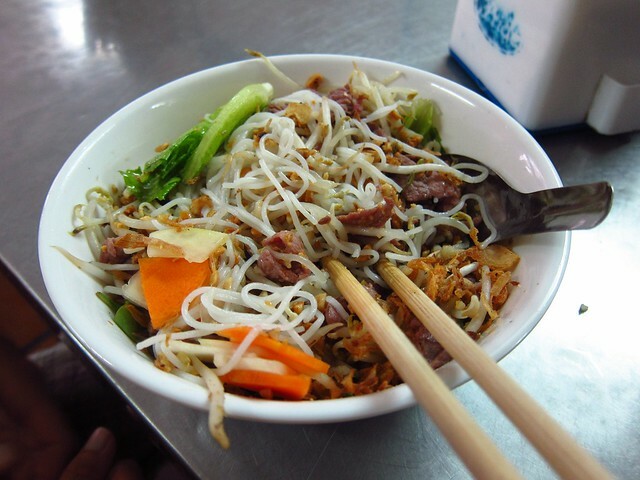 This salad starts with thinly sliced beef that is stir-fried fresh to order, to which noodles, bean sprouts, carrots, fried shallots, lemongrass, garlic, green mango, fresh herbs, and a tangy dressing are added. We quickly realized eating the free breakfast in our hotel was a major mistake as soon as we discovered banh cuon, a thin, freshly made rice pancake filled with minced pork, shrimp, and mushrooms, and only served in the morning. One serving contains about 10 of these darling crepes, which we found to taste more like dumplings. They're topped with fried shallots and basil, and served with a dipping sauce. If the filling isn't breakfasty enough for you, you can ask for one to be made with an egg inside instead of the traditional filling. 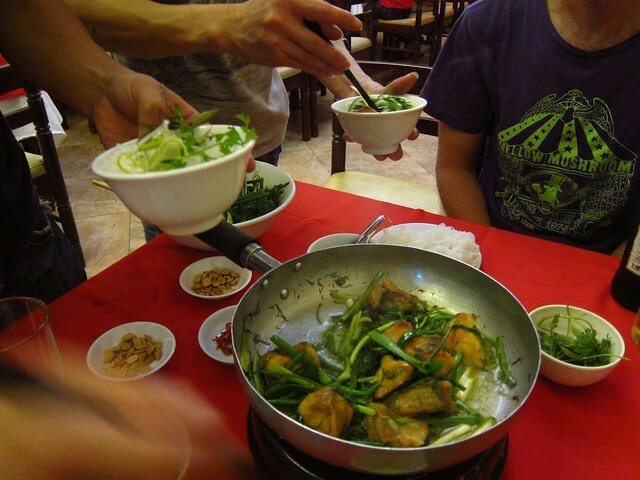 This is the one Vietnamese dish that is well-known around the world, but not surprisingly, it tastes best in Vietnam. It seems that pho joints take up almost every other hole-in-the-wall storefront or alleyway. Pho is served with either chicken or beef most of the time, and we definitely preferred the beef variety (pho bo). We soon learned that we had always eaten southern Vietnamese pho in the US, which is served with bean sprouts and piles of herbs on the side, and also with a thinner, rounder noodle than in the north. But both varieties start with a delicious beef broth that takes at least eight hours to make, to which soft, fresh noodles, thinly sliced onions, herbs, and tender slices of beef are added just before serving. Pho is usually eaten for breakfast, but can often be found later on in the day too since it's such a popular meal. These Vietnamese sandwiches are probably the second most famous Vietnamese street food (after pho). However, we had assumed that banh my referred to a sandwich with specific fillings (thinly sliced red roasted pork, mayo, lettuce, carrots and cucumbers), since that is the only Vietnamese sandwich I've ever seen on a menu in the U.S. 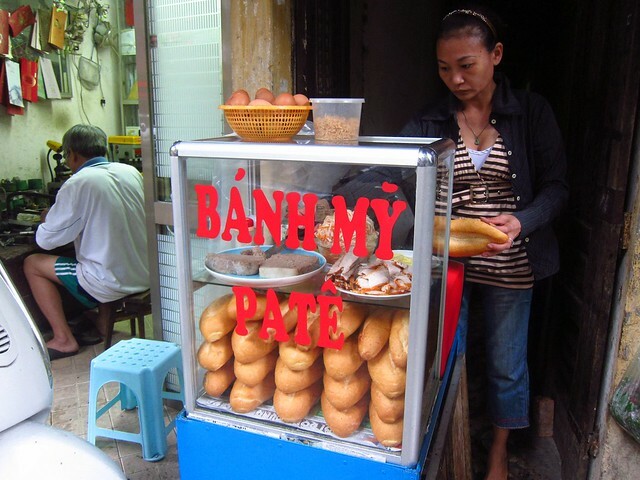 Turns out banh my is actually just a term for the French-style baguette so ubiquitous in Vietnam, and it can be served with numerous fillings. Old habits die hard though, and the pork variety is still our favorite. I wish I could tell you what was in these savory fried snacks, but I have no idea. What I do know is that you cannot go wrong with one of these tasty treats. Vietnam's version of the Indian samosa is served with plenty of fresh herbs and a tangy dip made with fish sauce and pickled veggies. Xoi is sticky rice, and a popular way to fill up on the cheap. Many fast food xoi joints can be found in Hanoi where you pick a kind of xoi (plain, with corn, etc. ), and then choose from a list of meat and veggie toppings. We tried plain sticky rice with cinnamon pork, plain sticky rice with corn and chinese braised pork, and sticky rice with corn, chicken, and mushrooms. The third bowl was probably excessive, but we indulged nevertheless because it was too delicious! 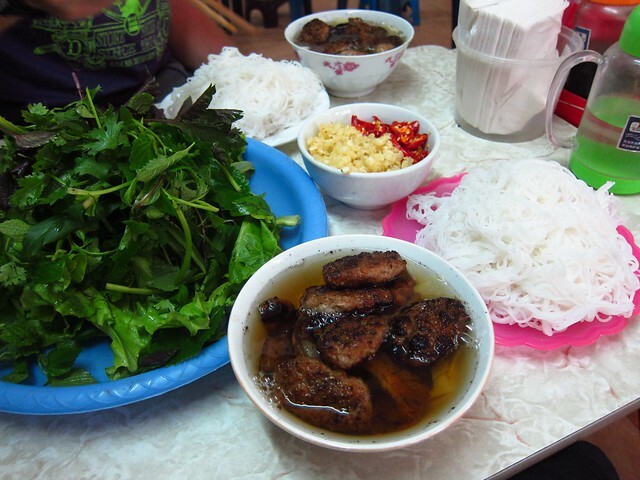 Although it's not a street food, cha ca deserves a mention here because it's such a typical Hanoi dish. There are a couple very old cha ca institutions in Hanoi, and they serve only that. The morsels of turmeric-dusted juicy catfish are cooked at your table with fresh dill and green onions, and are served with noodles, more fresh herbs, fish sauce, peanuts, and chilies. At first we didn't get what the big deal was, but as soon as we bit into the fish, we understood this dish's popularity: the fish was some of the most tender and flavorful that we've ever had. 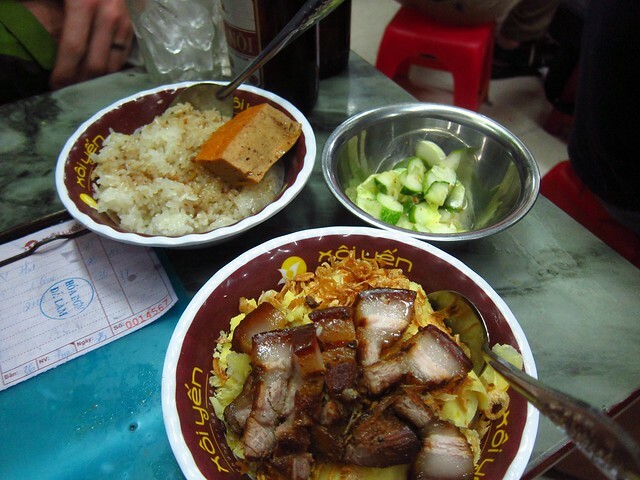 I know I won't be able to re-create this dish at home, so I guess we'll just have to return to Hanoi if we ever want to taste it again! Some like it sweet: the Vietnamese certainly do. They make their coffee strong and mix it with almost an equal amount of condensed milk (they call it "sweet milk"), which is sinful but addictive. 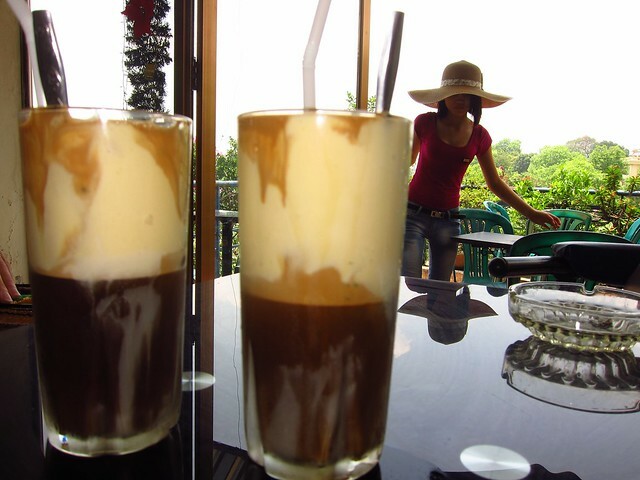 Caphe trung takes this to the next level: condensed milk is whipped with an egg white until it reaches a consistency nearing mousse, and this is poured on top of strong iced coffee. You eat it with a spoon, because let's be honest: this drink is not coffee, it's a decadent dessert. I'm shocked Starbucks hasn't hopped on this train ("Vietccino" doesn't have the best ring to it though).